Flt Lt Michelle Goodman DFC was born in Bristol on 22nd November 1976. She attended junior school at Gracefield in Fishponds before joining Bristol Grammar School at the age of 11. At Bristol Grammar School she obtained 10 GCSE's and stayed on through sixth form to complete A-Levels in Maths, Physics and Chemistry. Even though the RAF does not require a degree to join Michelle's intention was to continue with further education. She studied for 4 years at The University of Manchester and achieved a 2:1 Masters in Aerospace Engineering. Michelle's interest in the Royal Air Force had started back when she was 9 years old. Her mum and dad had taken her to Fairford Airshow and since she saw the Vulcan flying overhead she had made her mind up that she wanted to be a pilot. Michelle started Officer Training at RAF Cranwell in May 2000 and after finishing in the November joined Yorkshire University Air Squadron to fly the Tutor at RAF Church Fenton. After flying the Tutor pilots get streamed into fast jets, helicopters or multi-engined craft and Michelle was chosen to start basic fast jet training on the Tucano at RAF Linton-on-Ouse. Unfortunately, after 100 hours on the course she was re-streamed to helicopters but this proved to be the best choice for her career. RAF Shawbury is the helicopter training base and there are 3 squadrons; 660 and 705 Squadrons fly the Squirrel helicopter and 60 Squadron fly the Griffin. 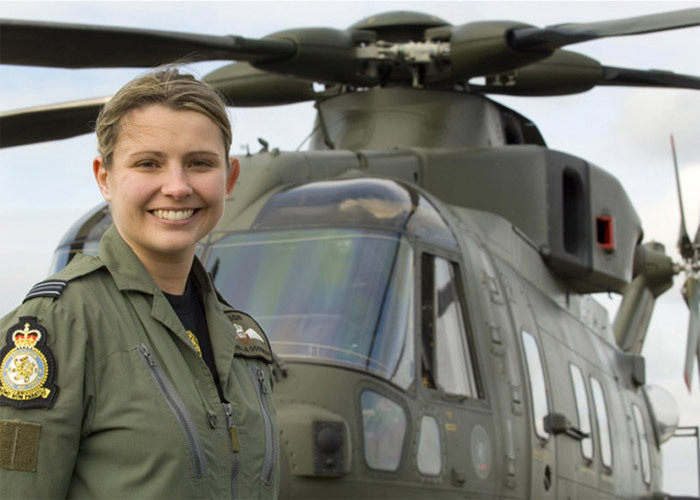 Michelle completed basic and advanced helicopter training to high standard and got her first choice to join the Merlin fleet on 28 (AC) Squadron at RAF Benson. 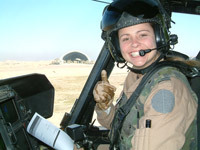 After 5 years of training she was finally on the front line in May 2005 as a Limited Combat Ready pilot. 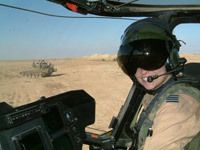 Michelle's first operational detachment was on Op TELIC in Iraq in January 2006 and since then she completed a further 3. "The crew was in bed asleep when a loud knock came at the door, 'Wake up you've got a callout!' I jumped up and dragged on my flying suit, grabbed my weapons and ran out to the aircraft. Sgt Steve Thomas was right behind me. Flt Lt George Williams and Sgt Chris Parker went to the Operations room with the medics to find out what was happening. The crew need to know how many casualties there are, what their injuries are and where we are going to pick them up. It was all very confusing as the site was still under fire, they came out to aircraft and we all waited for the instructions to come through on the radio. Within a couple of minutes we had learned that there was a seriously injured soldier with a shrapnel wound to the head in the centre of Basra city. As we took off it was very dark and we were flying night vision goggles but even with them the visibility was very poor. We headed to the city at low-level, at this height you not only have to worry about the enemy but the wires and masts that are at a similar height. None of the crew had seen or been into the landing site before and the last time it had been used was several years ago. On the approach we could see several flashes around us but chose to continue. At about 20 feet the dust was so bad that I could not see the ground, I was now relying on Sgt Steve Thomas to guide me safely to the ground. The time it would have cost to go around and re-do the approach was unacceptable to the casualty. On the ground the rockets were getting closer but the medics are highly proficient at what they do so within 5 minutes we were getting airborne again. As the helicopter rose above the roof tops 4 Rocket Propelled Grenades were fired in our direction. 15 minutes after the callout we were landing at the hospital so the soldier could get the medical care that was vital for his survival." Flt Lt Goodman is currently serving with 78 Squadron and is hoping to train as an instructor next year before going out to Afghanistan on Op HERRICK.